Just imagine sipping on a craft beer on a sunny afternoon while taking in the enticing aromas of charcoal grilled wings. Things get even better when you realize that you are not the one actually doing the grilling. As I mentioned in the last post, on Superbowl Sunday we spent most of the day outside. Chris brewed an IPA and grilled some chicken wings over charcoals. I definitely prefer nicely charred grilled wings to fried or even baked ones. I love the crispy skin, the scent of charcoal and its faint bitterness. When it comes to wing sauces, I am open to pretty much anything as long as it is not buffalo. The sauce Chris made yesterday was near perfect. Aromatic and flavor packed, fresh, with a slight kick balanced by sweetness. All the flavors bound together by the hoppiness of a well crafted IPA. You have to try this recipe once. It will be enough to get you thinking about what you could tweak to suit your personal preferences (even though I am pretty sure you’ll like it just the way he made it yesterday). 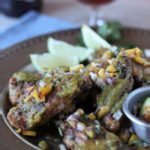 Charcoal grilled wings with craft beer in the sauce can easily become your new favorite way to tackle chicken wings. The ingredients are mostly shown in the picture above, with the exception of the pinch of salt and the generous squeeze of lime juice Chris decided to include in the sauce after we tasted it and before he tossed the wings in it. 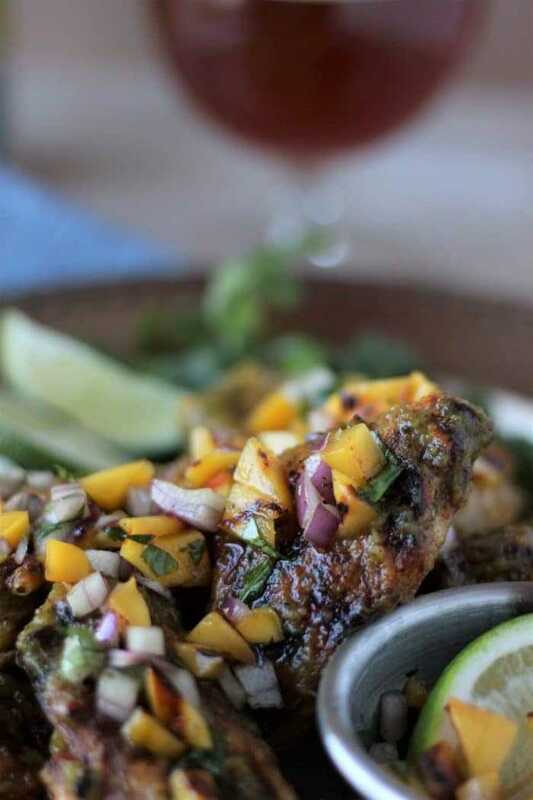 Basically, you need to peel a larger ripe mango fruit and cut it in big chunks that you can grill together with the wings. You want to mark the chunks really well but not cook them entirely. Also throw two jalapenos on the grill while you are at it to get them charred all over, then place them inside a plastic bag to sweat. When they cool off clean out the seeds and the ribs. Do not worry that the sauce will lack heat after the seeds and ribs are gone. The IPA will elevate the remaining heat. We used Avery Brewing Co. Hog Heaven Imperial Red IPA yesterday. Any IPA with similar profile will work out perfectly in this sauce recipe. Chris added honey, fresh cilantro and rice vinegar to the mango, jalapenos and IPA and used a hand blender to combine them. 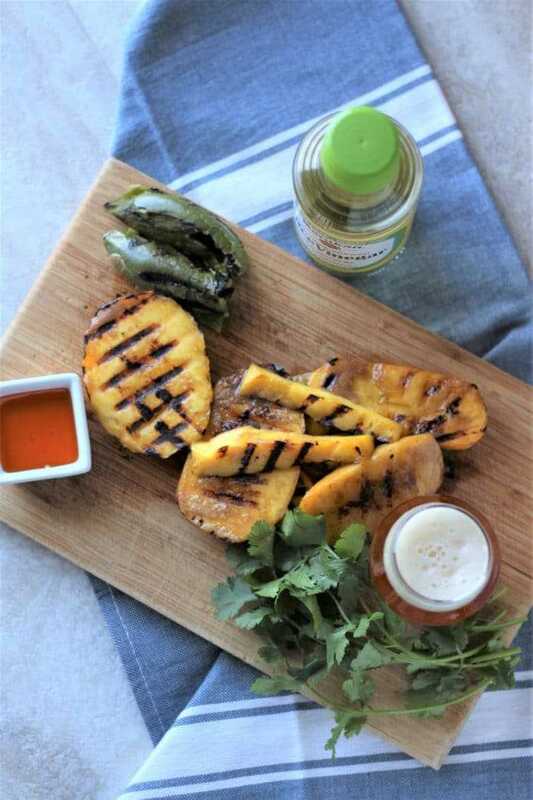 He reserved two small pieces of grilled mango and about a third of one of the jalapenos to make a salsa to top off the charcoal grilled wings. If using a charcoal grill with a height-adjustable grate start by spreading the hot coals uniformly over the bottom and position the grate closer to the coals. Close the lid and heat up to 400°F then place the wings on the grate. Sear them well on both sides. Once they are nicely charred adjust the grate up to move them away from the heat. Close the lid and let them cook until the internal temperature taken with a food thermometer reaches 165°F. If using a pit type grill spread hot coals on one side of the pit and place the grate on top. Cover until the temperature reaches 400°F. Place the wings directly over the coals. Sear them well on both sides. Once they are nicely charred move them away from the heat, making sure that the meatiest parts of any drumsticks are situated closest to the heat from the charcoals. Cover the grill and allow wings to cook. Use a food thermometer to measure the temperature – when it reaches 165°F the wings are done. Sear the jalapenos on the grill until charred and place them inside a plastic bag to sweat. Peel the mango and cut in large chunks around the pit. Mark the mango chunks on the grill and place most of them inside the blending jar of a hand blender. Reserve one or two smaller mango pieces. Add most of the cilantro, honey, IPA, rice vinegar and salt to the blending jar. Reserve 2 stalks of cilantro. Peel cooled off jalapenos, remove the seeds and inside ribs. Reserve one small piece (about 1/3 of one of them) and add the rest to the other ingredients. 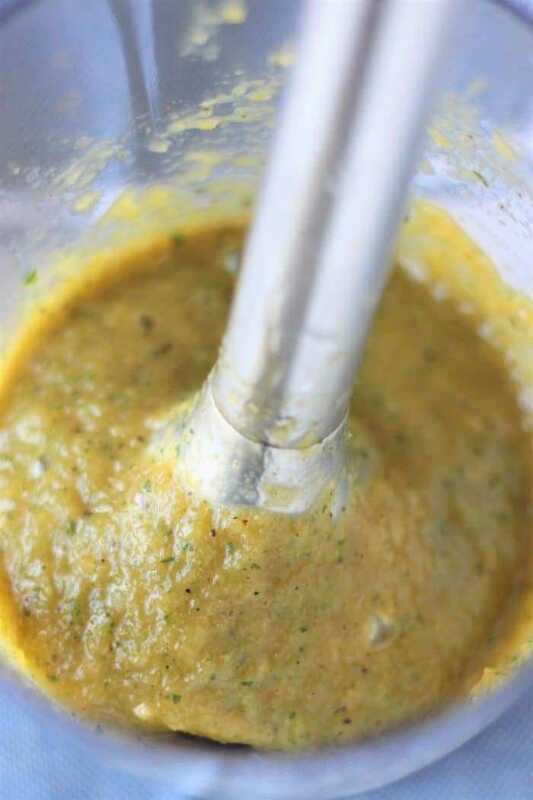 Use the hand blender to create a thick sauce. Dice the reserved mango, jalapeno and cilantro and combine with the diced red onion (in a ramekin). 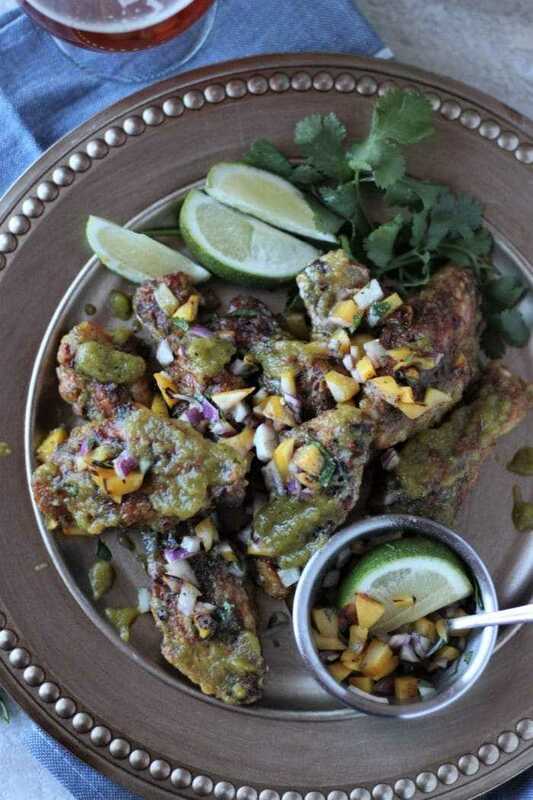 Toss the grilled wings in the sauce (split wings and sauce in two batches so they are well coated). Plate and drizzle the diced mango, jalapeno and red onion salsa on top.